blog.samseidel.org: Alan Furst reads from his new novel at Porter Square Books. Alan Furst reads from his new novel at Porter Square Books. It’s Paris. It’s 1938. The German threat is increasing, spies are showing up in larger numbers in the City of Light, and an American film star is being asked to keep tabs on anyone suspicious he’s meeting. It’s the opening gambit of the 2012 Alan Furst novel Mission to Paris, and it’s quintessential Furst, capturing not only the politics but the menace of the time. Called “the best in the business” with stories that are “action-packed and grippingly atmospheric”, Furst is talented, formulaic, and has a following. 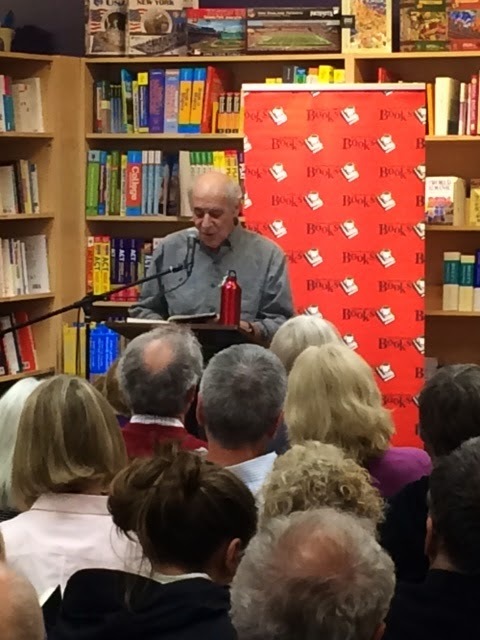 His loyal fans showed up in droves at Porter Square Books in Cambridge last night to hear him read from his latest novel, Midnight in Europe. On a soft winter evening in Manhattan, the fifteenth of December, 1937, it started to snow; big flakes spun lazily in the sky, danced in the lights of the office buildings, then melted as they hit the pavement. At Saks Fifth Avenue the window displays were lush and glittering — tinsel, toy trains, sugary frost dusted on the glass — and a crowd had gathered at the main entrance, drawn by a group of carolers dressed for a Dickens Christmas in long mufflers, top hats, and bonnets. Here then, for as long as it lasted, was a romantic New York, the New York in a song on the radio. Furst has now produced over 12 books, all set at the edges of World War II. He does not seek the traditional narrative of the war, the major battles, the lead actors both political and military, the defining moments. He cozies up to the smaller characters whose lives are soon to be transformed by the peril and chaos of the times. A master of mood, his atmospherics are magnificent. It's a display of just how much weight a simple sentence can carry. He looks the part of the writer, elderly, short, bald. He stoops as he stands but reads clearly, without flourish. He's smart enough to know not to overdo it. When he finished, he asked “What’s next best after S & M? Q & A.” A witty guy, he lives in Sag Harbor on Long Island after many years in New York City. "Which comes first, characters or plot?," an audience member wanted to know. Without pause he retorted, characters. Then he rephrased it — first comes the historico-political setting, then come the characters, then comes the plot. He’s trying to see how his fictional characters respond in real-world historical contexts. First where. Then who. Then what.